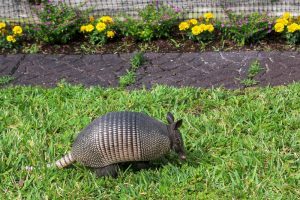 The Critter Team specializes in armadillo removal and trapping. In our area we have the nine-banded armadillo, and are normally about the length of a cat. A armadillo is a prolific digger, they dig multiple burrows for homes and also for food. They eat invertabrates and insects. These burrows are often used by other animals once abandoned by the armadillo. The armadillo original habitat is in wood, brush, scrubs and grasslands. They have evolved into living in our community. They now dig under deck, patio, and even under the foundation of your home. Are you noticing your freshly manicured mulch bed dug up? Are there large holes appearing in your yard. There is a very large chance that this could be from Armadillos. Armadillo Removal is very important to our clients. The yards that are usually the most effected are the ones with fresh mulch and also yards that are water regularly. This softens the yard which is exactly what is desired by them.